Wifestyles Blog & Photography: Holiday Traditions! Meet Erin! Hey all! I'm excited to be guest blogging for Lauren today. I’m not a coffee drinker at all so I don’t do Starbucks except during holidays. I LOVE their Peppermint Mocha’s!! I also love to make white hot chocolate. Dec 17—Christmas w/ hubby’s extended family (aunts, uncles cousins) to do a $5 grab bag gift. It’s the type of grab bag where you can make trades, so it’s always a fun time! Dec 25- Waking up to do stockings & gifts w/ hubby (ps- Stockings are my FAVORITE part of Christmas). Then going to my other grandparent’s house. Dec 26- Christmas w/ Hubby’s immediate fam- parents, two brothers & their significant others. Every year on Christmas Eve, someone new is assigned the duty of decorating this collection of hats my Grandma has. This tradition has been around since I was a little one. 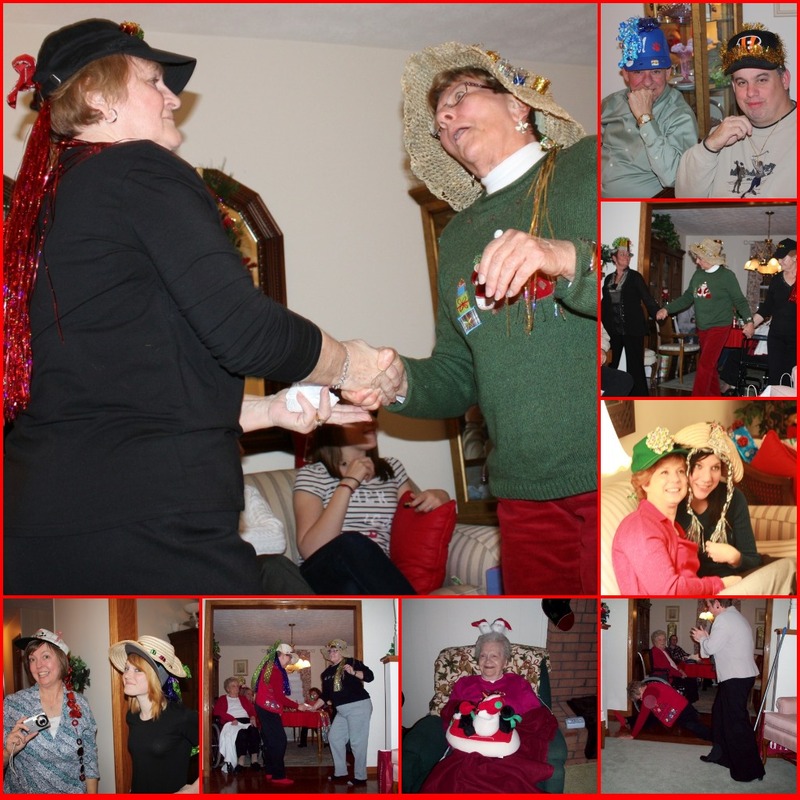 The silly hats are passed out to most of the adults and then the silliness begins. My grandma has all these Party/Dance CDs that she insists on putting on every year. We limbo, do the YMCA, my Grandma swing dances- and year after year we teach her the Electric Slide. J I love my crazy family. A new tradition will be whatever Hubby and I do this year. We’ve been talking about doing special Christmas breakfast for the morning while we open our presents. Not sure what it will consist of yet, but I’m sure that will soon be a tradition and we will only add to the traditions as the years go on! A crazy star that changes colors- I wasn’t a huge fan, but Hubs picked it out and loves it. I like to have colored ones on the trees. I love the look of all white lights on a house though. I LOVE to make Peppermint Bark. I know lots of people make it, but here’s the recipe I follow. I put all the candy canes in a big Ziploc bag and smash and roll them up with a rolling pin. Take 1 large cookie shoot and place aluminum foil down. Melt all the milk (or dark!) chocolate, then cover the pan with it. Stick it in the freezer to let it harden. Melt all the white chocolate and pour in peppermint extract. Once mixed and cooled, pour white chocolate over the first layer. Then sprinkle all the peppermint on top. Freeze’til hard. It means celebrating my Lord & Savior’s birth! He is truly the reason for the season!! It also means a special time with family, all celebrating the many blessings we share. How cute was Erin's first ever guest post?! I LOVED IT! I also love that your family has a crazy hat tradition! Too cute! Everyone please go check out my friend Erin's blog HERE! She's new to the blog world and would love some new friends! Thanks for following me! I am following you now too and have loved your blog!! Your wedding pictures are beautiful, and you and your hubby are such a cute couple! I look forward to reading and getting to know you more! Erin you did such an amazing job guest posting....this was so good! 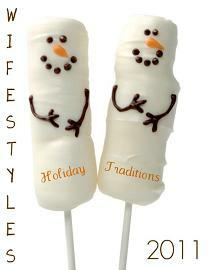 and i want some of those marshmallow snowmen in my kitchen right now! nom nom! congrats on the first guest post! and your family traditions sound fantastic!